There is a difference between a marine battery and a car battery. Thus, before getting into specifics, it is best to know how to differentiate one from the other. Get to know first the basics of these batteries for a better understanding, like the construction of its lead acid batteries and so on. The lead acid batteries are made from a variety of lead plates which was diluted in sulphuric acid. There are two types of lead acid batteries, first is the starter batteries which are used in cars; there are more lead plates that can be found in this kind of battery. The second type is the deep cycle batteries, which has lesser plates but thicker and heavier. Marine batteries are a hybrid of the two (the starter batteries used for cars and the deep cycle batteries), as it much similar to car battery plates but have thicker ones, which make it sturdier. Why choose Vmaxtanks MR107 as, a RV battery ? What is the best kind of charger to use for the Vmaxtanks MR107? The VMAX tanks are manufactured to never have an excessive accumulation of gas within its battery. That is why it is equipped with safety release valves which are designed to operate and automatically reseal. The Vmax MR 107 has a heavy duty lead tin alloy which will give an extra performance and service life margin even after a few discharges. Without using any silica gels, or other contaminants, the vmax tanks utilize the electrolyte suspension system which consists of AGM (Absorbed Glass Matt) of high porosity to completely absorb and contain the electrolyte. The Vmax has a built- in design to control its gas generation to induce recombination of gases generated during float usage. The battery life span of the VMAX tanks is known to last a span of eight to 10 years. It is important to know and understand the basic information and comparisons of deep cycle batteries. 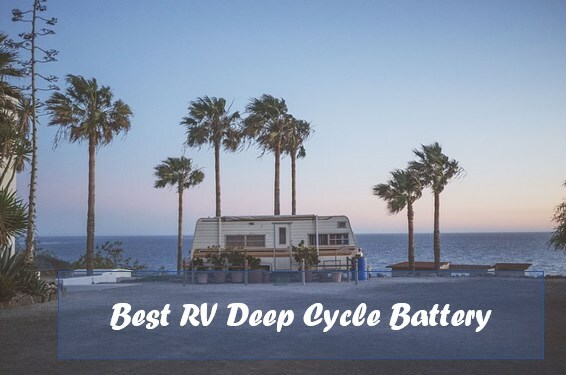 This is because that way you will be able to choose right rv battery. With the perfect batteries for your boat, you can be rest assured whenever you’re on a travel. For the worth it amounts, you would want your batteries to last longer. The price of these batteries is quite expensive and a long lasting battery is exactly what the VMAX tank offers. The VMAX tank offers a heavy duty battery for boat motor, and it is good for a day’s activity; can even go for no power loss at all. You can have multiple appliances run at the same time and still no need to worry about suddenly losing power. The manufacturing process that the vmax undergoes is known to give them unique reliability, strength, and a high- performance to exceed other similar products in the market. Its AGM is designed to add more physical and electrical advantages and this makes it perfect for your rv. The charger to best work with your VMAX tank is a 14.5V Constant Voltage Three Stage (you can follow this guide) AGM battery charger. Cash on Delivery payment term is not accepted by the manufacturer. Free shipping applies to only the 48 states within the United States, anywhere outside will be subjected to respective shipping fees. An important point to note for long lasting experience with this product is how you intend to store it. For storage, always make sure that the battery is away from any moisture. Storage place must be clean, dry, well- ventilated and with a room temperature range of 10°F (-12°C) – 104°F (40°C) degrees. It is important that you see to it that your battery is charged properly before putting it to storage; if you are about to store it for a long time, make sure that you recharge it at least every three months just to keep it in tip-top shape. 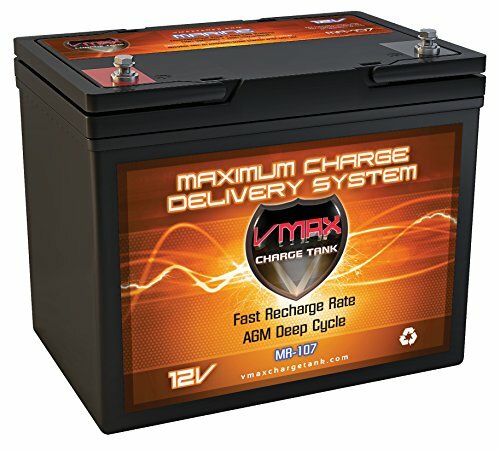 The Vmaxtanks MR107 is one of the best battery out in the market for your rv. It will give you the satisfaction of lasting for hours daily, and enable you to enjoy spending your time in your motor boat or kayak . Looking for a battery that will be worth the buy, this is it. You can be sure of its durability as well as its quality. While there are chances of it reducing its battery life, by knowing the proper maintenance and storage, your battery is going to be worth your money even when they experience discharges, it may still last for about eight years. The AGM is one of the main features of this battery, as it will be the one to take care of the battery from the inside.